I’m celebrating my 11th year as a cancer survivor and activist. I have been blessed with over a decade of grace. I was born in April 1961 and spent the majority of my childhood in Kuruman. As a young adult pursuing my lifelong dream to be an educator, I relocated to Mafikeng and married Rev. Tshwene Raymond Holele in 1987. We are blessed with two beautiful daughters, Kitlano and Ngata. 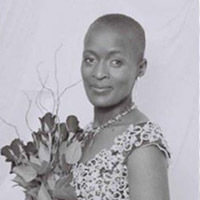 On Friday, 27 August 2004, at the age of 43, I was diagnosed with breast cancer. I underwent a mastectomy on my right breast weeks later and proceeded with Chemotherapy and radiation treatment. This was a challenging period in my life, but I tried to maintain a positive outlook. My family, colleagues and my church supported me through this tough period, and for that I am extremely grateful. I am of the same opinion, as TD Jakes once said, that when you are down to nothing, God is up to something. I believe I have been called to make every day a World Cancer Awareness Day. It is with this attitude that I continue to soldier on and spread knowledge about cancer and how to overcome it. My personal experience has enriched my capacity and ability to touch the lives of those around me. I’m venerated in my community and assume many roles: Sunday School Teacher, Deputy Principal at Batswana High School, member of the Anglican Mothers Union, member and volunteer of Moitsheki Skills Community Development Centre, cancer survivor and activist, wife and mother. My aim is to remind people that cancer is a not a death sentence and early detection can save lives. With education, we can support and motivate other cancer survivors. Cancer can be beaten.